Please note that these apt pages are obsolete. They were written in the days when yum didn't yet exist, when apt was the only decent dependency tool for rpm around. This has changed, you should really prefer yum over apt for rpm which is now unmaintained. APT (Advanced Package Tool) is a dependency tool, well known to Debian users since it is used by default with their dpkg packages. But apt has been ported to work with rpm packages too, by Conectiva, who has now used it for some time in their GNU/Linux distribution. The good news is that apt for rpm may be used with any other rpm-based distribution. All you need is the tool compiled for your version of rpm and at least a repository where rpm packages and their apt metadata can be downloaded from. 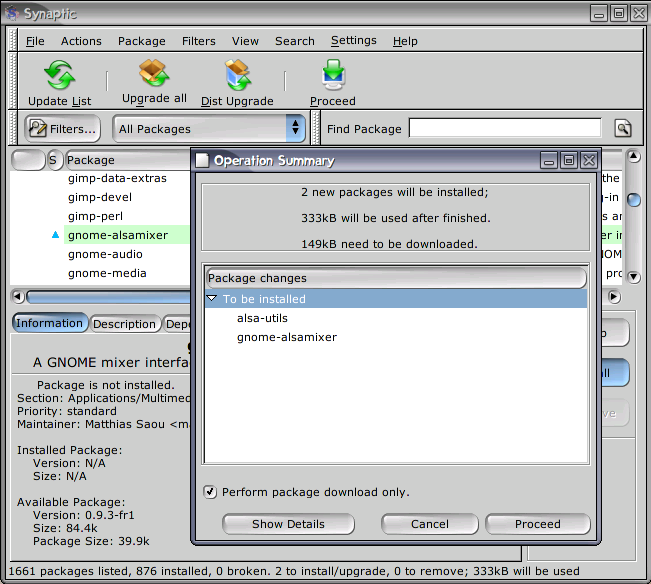 You can find apt packages for Red Hat Linux releases in the packages section. You don't need anything more to get started as they all come pre-configured, but you can later configure your client to download packages from a server closer to you, or from one offering add-on packages you're interested in. The apt client is quite simple to use, especially if you are already familiar with rpm. If you like having a graphical interface, there is a great gtk2 front-end called "synaptic" which you may also download from here. Once installed, just run "System Settings > Synaptic". If you've never seen it before, take a look at the synaptic screenshot. Binary packages of apt for most Red Hat Linux releases can be found on http://apt.freshrpms.net/. Just download the package for your distribution then install it as root with rpm -Uvh apt-* and you'll be all set. If you feel a bit lost, you might then want to install synaptic by simply typing apt-get update && apt-get install synaptic as root. Since apt needs metadata about available packages, the original Red Hat Linux CD-ROMs can't be used directly with the apt-cdrom tool, which is why apt is generally used only through the network. You can however get or create the needed metadata and burn new CDs which include it. Planet CCRMA has detailed instructions about this process for Red Hat Linux 8.0, and you can do the same for Red Hat Linux 9 using the files and instructions below. Repeat the above with all 3 binary discs, you don't need to do it for the 3 source discs as it wouldn't be useful.